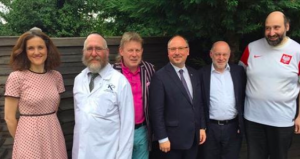 On 16thJuly 2017, the incoming Polish Ambassador, HE Arkady Józef Rzegocki, was the guest of honour at a very well-attended and most successful BBQ hosted by our IPJS Council Member Filip Slipaczek, and presided over by our new IPJS President, Vivian Wineman. Among the guests were The Rt Hon Theresa Villiers, the Chipping Barnet MP; HRH Princess Katarina of Serbia; Councillors from Barnet, Camden and Hackney Councils; the past President of the United Synagogue; the past President of the Board of Deputies; representatives from the Board of Deputies; the founder of Faith Matters; and many others. Thank you to Filip for this opportunity to renew old acquaintances and make new ones.